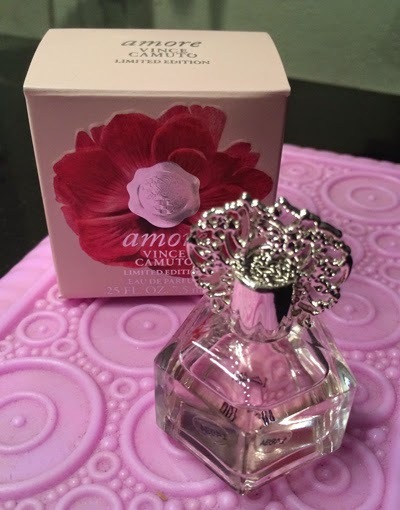 THE SKINNY: With the big flower on the package, I was quite skeptical of Vince Camuto Amore Eau De Parfum. But I was pleasantly surprised. The fragrance was feminine and light but not too flowery. From the manufacturer: "Our newest scent is inspired by undying passion and romance. Be the woman you wish in this sweet and tantalizing perfume. Fruity top notes mix with the organic smell of freshly picked flowers"
That description seems a little over the top, but the fragrance works for a day at work without being overwhelming. One downside is that the fragrance does not seem to stick around all that long. CHECK IT OUT: This limited editor fragrance will only be around for a short time from Vince Camuto.